Tinker, Tailor, Soldier, Say what now…..? I love a cat and mouse film (no not Tom and Jerry the movie) but something all the more sinister. In fact when I was a wee nipper in the 80’s my dad would sit me down in front of TV shows showing a healthy bit of espionage and I was hooked. Everything from The Man From U.N.C.L.E. through to The Avengers and even the The Saint – anything with a bit of charm, mystery, and immense coolness had my vote (age 8!). 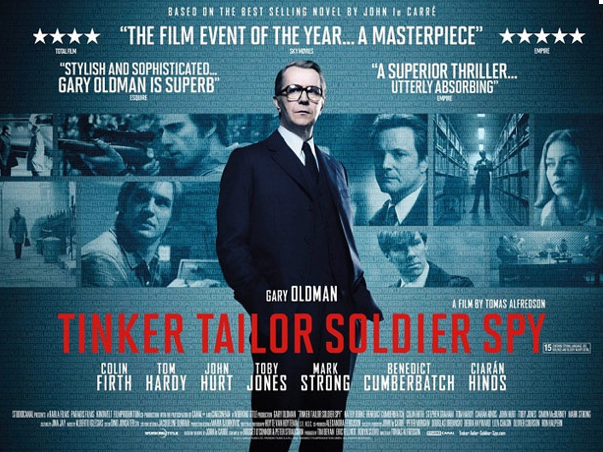 So you can understand that there was an element of excitement going to review Tinker, Tailor, Soldier, Spy for next week’s Film Friday radio show at The Everyman Cinema in Oxted. What I love about this cinema is that its retro feel was the perfect setting for a 1970’s spy drama to unfold. I was in the minority of young people going to watch the film, its general audience were those of an age who remember the day of the great spy dramas well, and in-fact, with all the new up-coming trailers playing, I had one incredibly keen mature spy fan sat behind me, telling his partner that he wishes all this ‘modern tosh’ would just hurry up and make way for the real entertainment that was about to unfold. I couldn’t help but slightly chortle to myself and agree with him. Tonight and this cinema was not a place for new action releases, vampires, werewolves and aliens, it was a place to transport us back to the glum, cold problematic era of the early 1970’s where gentlemen were still highly regarded and massive street car chases were not necessary. Most of my notes throughout the film were made even before the opening credits. 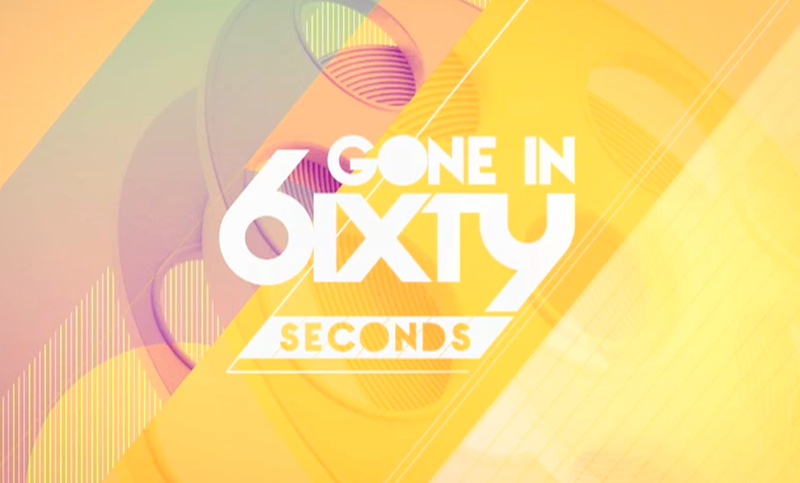 There is a beautifully rich opening sequence to the film which sets the scene and time so perfectly in every element that it’s almost like a documentary, an insight into the inner workings of ‘The circus/MI6.’ One thing that I wanted to point out was the cinematography, it had a beautiful grainy effect which allowed it to be just that little bit under crisp that you actually felt that this film was pulled out from the archives and run on 8mm film having been shown for the first time in thirty years. The most dramatic action sequence happens in the first few minutes and from then on, it’s about listening intently and playing an extremely complicated game of Cluedo in your head as you follow Gary Oldman’s excellently executed character George Smiley’s quest for finding the mole in Her Majesty’s Secret Service. Oldman’s choices of films are something to be admired, and this is no exception. You can tell that a great actor, and of course a privileged actor is able to make clever choices about their film roles and that is probably why after Kung Fu Panda 2 and Harry Potter he wanted to remind us once again that he is the real deal – after all what other actor out there at the moment, can have you knowing what he’s thinking from a shot angled at the back of his head – pure power! Not leaving all the praise over to the mighty Oldman alone, this welders son is joined by an absolutely stellar cast of Britain’s finest male actors. John Hurt, Toby Jones, Colin Firth, Tom Hardy, Benedict Cumberbatch and Mark Strong all have excellent turns throughout this film and it really does keep you second guessing with who you believe and who you trust. Their strong portrayals of the helm of MI6, their subtle individual glances, along with the clever editing and a fantastic soundtrack makes you feel you’re in on the game, you’re being asked your thoughts on who you think is the mole, and it makes for a thoroughly engaging couple of hours. What I particularly loved is the lack of obvious action. This was more of a snapshot of what the great British spy work was all about, it’s not blown up cars, excessive running and guns a-blazing every twenty minutes, its pure adrenalin of the guessing game which is why you cannot afford to take your eyes off the screen for one minute – let alone any sort of toilet break! The slow pace is deceptive because the intelligence of this film is so fast! This film may be coloured as brown as a 1970’s sitting room, but it is by no means beige!! 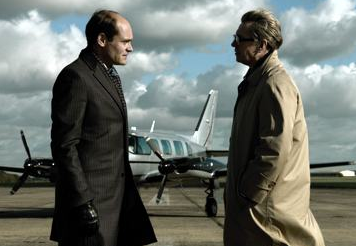 Tinker Tailor Soldier Spy is a solid film, captured in a manner completely of its time, its gripping, intellectually fast paced, and still keeps you analysing and guessing the morning after. Who was that character’s connection to so and so? Why were they at that point? Etc, etc… A stellar spy drama and something that the Hollywood studios should learn from, an oldie but a goodie! Its showing all this week and next at The Everyman Cinema in Oxted as well as all major cinemas in London town!